This is a scalable context timeline. 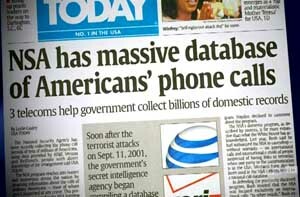 It contains events related to the event May 11, 2006: USA Today Reports NSA, Telecom Firms Cooperating in NSA Domestic Surveillance. You can narrow or broaden the context of this timeline by adjusting the zoom level. The lower the scale, the more relevant the items on average will be, while the higher the scale, the less relevant the items, on average, will be. A lieutenant general meets with Qwest CEO Joe Nacchio and Dean Wandry, who heads Qwest’s government business unit. 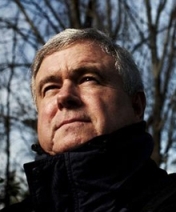 According to documents filed in 2006 by Nacchio concerning his trial on insider trading charges (see October 12, 2007), the general “told Mr. Wandry that he ran the largest telecom operation in the world, he had looked at Qwest’s network, and he wanted to use it for government purposes.” The general in question could be NSA Director Kenneth Minihan, who will be replaced in 1999 by another lieutenant general, Michael Hayden, but neither Minihan nor Hayden will comment on the allegation. Many former intelligence officials will say that it is likely Minihan who met with Nacchio and Wandry. Nacchio’s court documents indicate that he and Wandry agree to work with the general. Nacchio is not allowed to announce the contract publicly, but according to the court documents, he “understood at the time this was the beginning of a relationship which had enormous potential for future work. This proves increasingly true as time went on.” By 1999 Qwest is working extensively with the NSA. Minihan is particularly concerned about the potential of “cyberwarfare” by foreign governments, terrorist organizations, drug cartels, and organized crime, a prospect which he felt the NSA is unprepared. He particularly worries about Russia and China; in June 1998, he will testify are training personnel in potential cyber-attacks. “These opportunists, enabled by the explosion of technology and the availability of inexpensive, secure means of communication, pose a significant threat to the interests of the United States and its allies,” Minihan will state. In 2007, a former senior NSA official will say that the agency felt those groups knew US privacy laws all too well and were capable of using those laws against the NSA and other intelligence agencies. He will say, “There was such a nuanced understanding of how to tie us in knots and use American law against us, that there were certainly pockets of people saying, ‘We’ve got to be assertive; we’ve got to be more aggressive on this.’” Hayden, Minihan’s successor, will be particularly willing to push agency operations to the edge of legality. After 9/11, Hayden will say, “We’re pretty aggressive within the law. As a professional, I’m troubled if I’m not using the full authority allowed by law.” [National Journal, 11/2/2007] The NSA will approach Qwest will a similar offer in the months before 9/11 (see February 2001). The NSA asks Qwest, a major US telecommunications firm and a cutting-edge provider of high-tech wireless and Internet connectivity, to reveal information about its customers and their phone calls. Qwest’s CEO, Joe Nacchio, refuses after meeting with NSA officials and deciding that the program is illegal without court orders (see February 27, 2001). The NSA refuses to seek court authorization for its wiretaps and electronic surveillance. The NSA will renew its request from Qwest after the 9/11 attacks, and will also ask the firm to help it track suspected terrorists. Other telecommunications firms such as Verizon, AT&T, and BellSouth, will comply with the NSA’s requests (see February 2001 and Beyond). Fears of a 'Digital Pearl Harbor' - According to a former White House official, the NSA’s primary purpose before 9/11 is to watch for computer hackers and foreign-government agents trying to hack into the government’s computer information systems, particularly those within the Defense Department. Government officials fear a “digital Pearl Harbor” if hackers were ever to seize control of those systems or other key US infrastructures. 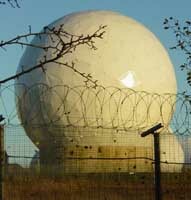 The former official will say in 2007 that the NSA’s proposal to Qwest is, “Can you build a private version of Echelon and tell us what you see?” Echelon is the NSA’s enormous signals intelligence (SIGINT) network used by the agency and its counterparts in Australia, Canada, New Zealand, and Britain. Qwest is constructing a high-speed network for phone and Internet traffic, and the NSA wants Qwest to keep records of its customers’ transactions for it. The NSA, another source will say, wants to analyze call, e-mail, and other transmissions’ traffic patters for signs of suspicious activity. The White House official will say that telecom firms such as Qwest “have an enormous amount of intelligence-gathering” capability. They don’t have to target individual customers to “look for wacky behavior,” or “groups communicating with each other in strange patterns.” Such information could augment intelligence that the NSA and other agencies were gathering from other sources, and enable the NSA to collect the information it wants without violating laws prohibiting it and other intelligence agencies from directly gathering data on US citizens. Ill Will from NSA - Nacchio’s refusal to go along with the NSA’s request garners it some ill will among the US intelligence community, the former White House official will say. Nacchio will contend that because of his refusal, the NSA denied Qwest a lucrative government contract. A former high-level intelligence official will add that other telecom companies had little problem agreeing to the NSA’s requests. Nacchio believes that the NSA’s request is illegal under the Telecommunications Act without court orders; the former White House official will acknowledge that it might violate the 1986 Electronic Communications Privacy Act. After 9/11, that law will be amended by the USA Patriot Act to give the government more room to monitor US citizens. An illustration of the NIMD dataflow. [Source: LibertyThink.com] (click image to enlarge)Shortly after the 9/11 attacks, the NSA awards $64 million in research contracts for a program called Novel Intelligence from Massive Data (NIMD). 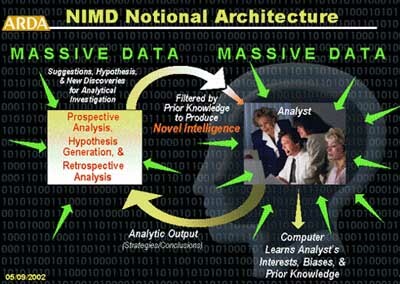 [New York Times, 5/21/2003; National Journal, 1/20/2006] NIMD is one of several cutting-edge data mining technologies that not only has the capability of finding keywords among millions of electronically monitored communications, but can find hidden relationships among data points, and even critique the thinking and biases of a particular analyst and suggest alternative hypotheses differing from the human analysts’ conclusion. Like other data-mining technologies, the NSA will steadfastly refuse to discuss whether NIMD is used to analyze data from domestic surveillance operations. NIMD is designed as an preliminary sort program, to keep human analysts from becoming overwhelmed by raw data. In essence, NIMD is an early-warning system. “NIMD funds research to…help analysts deal with information-overload, detect early indicators of strategic surprise, and avoid analytic errors,” according to the “Call for 2005 Challenge Workshop Proposals” released by the Advanced Research and Development Activity (ARDA). ARDA was founded in 1998 to create, design, and field new technologies for US intelligence agencies, particularly the NSA. A selected few Congressional lawmakers (see January 18, 2006) were informed that the warrantless surveillance program authorized by President George W. Bush (see Early 2002) was designed to be an early-warning system for possible terrorist attacks or plans. Assistant Attorney General William Moschella will inform the top Democrats and Republicans on the House and Senate Intelligence committees in December 2002 that the “president determined that it was necessary following September 11 to create an early-warning detection system” to prevent more attacks. He will justify the use of programs such as NIMD by claiming, as NSA director Michael Hayden and other administration officials have repeatedly claimed, that the Foreign Intelligence Surveillance Act (FISA), which allows the government to obtain warrants to conduct domestic eavesdropping or wiretapping, “could not have provided the speed and agility required for the early-warning detection system.” Many experts outside of the Bush administration feel that NIMD and other programs do not have to operate outside of the Foreign Intelligence Surveillance Act (FISA) because of limitations in the law, but because of the fact that the programs cannot meet the law’s minimum requirements for surveillance. FISA requires that any such surveillance must have a probable cause that the target is a terrorist. NIMD has no such threshold. Steven Aftergood, an expert on intelligence and government secrecy with the Federation of American Scientists, will say in 2006, “Logistically speaking, the early-warning approach may involve a significant increase in the number of surveillance actions. It may be that neither the Justice Department nor the [Foreign Intelligence Surveillance Court, which approves wiretapping warrants] is prepared to prepare and process several thousand additional FISA applications per year, beyond the 1,700 or so approved in 2004.” [National Journal, 1/20/2006] Some experts will later express the opinion that NIMD is the controversial Total Information Awareness program in a slightly different form (see February 2003 and September 2002). Nancy Pelosi. [Source: US Congress]House Minority Leader Nancy Pelosi (D-CA) writes to NSA Director Michael Hayden questioning the nature and extent of the apparently illegal warrantless wiretapping of US citizens by the agency. Pelosi and other members of the House Intelligence Committee were briefed on October 1, 2001, by Hayden, whose agency began conducting surveillance against US citizens after the 9/11 attacks (see After September 11, 2001). Pelosi will release the letter on January 6, 2006, three weeks after the New York Times revealed that the NSA had been conducting electronic surveillance of US citizens without warrants since at least 2002 (see December 15, 2005.) Pelosi’s office will also release Hayden’s response, but almost the entire letter from Hayden is redacted. Pelosi Unaware of Pre-9/11 Surveillance - Though Bush officials eventually admit to beginning surveillance of US citizens only after the 9/11 attacks, that assertion is disputed by evidence suggesting that the domestic surveillance program began well before 9/11 (see Late 1999, February 27, 2000, December 2000, February 2001, February 2001, Spring 2001, and July 2001). Pelosi is apparently unaware of any of this. Lawmakers Unaware of Pre-9/11 Surveillance - Though Bush officials eventually admit to beginning surveillance of US citizens only after the 9/11 attacks, that assertion is disputed by evidence suggesting that the domestic surveillance program began well before 9/11 (see Late 1999, February 27, 2000, December 2000, February 2001, February 2001, Spring 2001, and July 2001). In the briefing, Cheney informs the lawmakers of none of this. Sometime in early 2002, President Bush signs a secret executive order authorizing the National Security Agency (NSA) to wiretap phone conversations and read e-mails to and from US citizens. The order extends an operation set into motion at least as early as October 2001 to begin wiretapping US citizens’ phones in a response to the 9/11 attacks. When the program is revealed by the US media in late 2005 (see December 15, 2005), Bush and his officials will say the program is completely legal, though it ignores the requirements of the Foreign Intelligence Surveillance Act (FISA) that requires the government to obtain court-issued warrants to mount surveillance against US citizens. They will insist that only those suspected of having ties to al-Qaeda are monitored, and only when those individuals make or receive international communications. [New York Times, 12/15/2005; Washington Post, 12/22/2005; Newsweek, 12/22/2008] Bush’s order authorizes the NSA to monitor international telephone conversations and international e-mails of hundreds, and perhaps thousands, of US citizens without court warrants, in an effort to track what officials call “dirty numbers” linked to al-Qaeda. When the program is finally revealed by the New York Times over three years later (see December 15, 2005), officials will say that the NSA still seeks warrants to monitor domestic communications. But there is little evidence of this (see, for example, Spring 2001). The presidential order is a radical shift in US surveillance and intelligence-gathering policies, and a major realignment for the NSA, which is mandated to only conduct surveillance abroad. Some officials believe that the NSA’s domestic eavesdropping crosses constitutional limits on legal searches. “This is really a sea change,” a former senior official who specializes in national security law will say in December 2005. “It’s almost a mainstay of this country that the NSA only does foreign searches.” [New York Times, 12/15/2005] Some sources indicate that NSA domestic surveillance activities, such as data-mining, the use of information concerning US persons intercepted in foreign call monitoring, and possibly direct surveillance of US persons, took place prior to 9/11 (see Late 1999, February 27, 2000, December 2000, February 2001, February 2001, Spring 2001, and July 2001). The NSA’s enormous data mining program, Novel Intelligence from Massive Data (NIMD—see After September 11, 2001), closely resembles another data mining program, the Defense Department’s Total Information Awareness program (see March 2002). TIA, which will be suspended in 2003 after outcries from citizens and legal experts concerned over that program’s refusal to comply with fundamental Constitutional guarantees of privacy, was also designed as an early-warning system that not only compiled intelligence data, but mined through private financial databases for credit-card and other financial transactions. Six of the corporations and research institutions who win NIMD contracts also held contracts for the earlier TIA project. Much of their work with TIA duplicated the same aspects and protocols to be used by NIMD, including challenging analytic assumptions and building prototype data-mining devices. Both TIA and NIMD attempt to second-guess human analysts’ conclusions over a particular data schema by creating a database of what TIA creator John Poindexter once called “plausible futures,” or likely terrorism scenarios. NIMD is a creation of the Advanced Research and Development Activity agency (ARDA); another ARDA project, the Advanced Capabilities for Intelligence Analysis (ACIA) also envisions a similar database (see 2005). Though TIA focused more on counterterrorism than the more sweeping NIMD, the two projects coordinated closely with one another, according to former program manager Tom Armour, who worked in Poindexter’s office. The Narus STA 6400 - Klein discusses one key piece of equipment in the NSA’s secret room, the Narus STA 6400 (see Late 2003). Narus is a firm that routinely sells its equipment not only to telecom firms such as AT&T, “but also to police, military, and intelligence officials” (see November 13-14, 2003). Quoting an April 2000 article in Telecommunications magazine, Klein writes that the STA 6400 is a group of signal “traffic analyzers that collect network and customer usage information in real time directly from the message.… These analyzers sit on the message pipe into the ISP [Internet Service Provider] cloud rather than tap into each router or ISP device.” Klein quotes a 1999 Narus press release that says its Semantic Traffic Analysis (STA) technology “captures comprehensive customer usage data… and transforms it into actionable information… [it] is the only technology that provides complete visibility for all Internet applications.” The Narus hardware allows the NSA “to look at the content of every data packet going by, not just the addressing information,” Klein will later write. Concealment from FISA Judges - Tamm learns that the NSA program is being hidden from the Foreign Intelligence Surveillance Act (FISA) Court, a panel of federal judges who by law must approve and supervise such surveillance for intelligence purposes. OIPR lawyers ask the FISA Court for permission to implement national-security wiretaps. But, Tamm learns, some wiretaps—signed only by Attorney General John Ashcroft—are going to the chief FISA Court judge and not the other ten judges on the FISA panel. The “AG-only” requests are extraordinarily secretive, and involve information gleaned from what is only referred to as “the program”—Stellar Wind. Only a very few White House and US intelligence officials know the name and the nature of “the program.” Stellar Wind involves domestic wiretaps on telephones and computer e-mail accounts derived from, but not necessarily linked to, information secured from captured al-Qaeda computers and cell phones overseas. With the voluntary cooperation of American telecommunications companies (see 1997-August 2007 and After, February 2001, February 2001, and February 2001 and Beyond), the NSA program also collects vast amounts of personal data about US citizens’ phone and e-mail communications. The program also collects an enormous amount of financial information from the Treasury Department (see February 28, 2006), all collected as part of the NSA’s “data mining” efforts (see Late 1999 and After September 11, 2001).